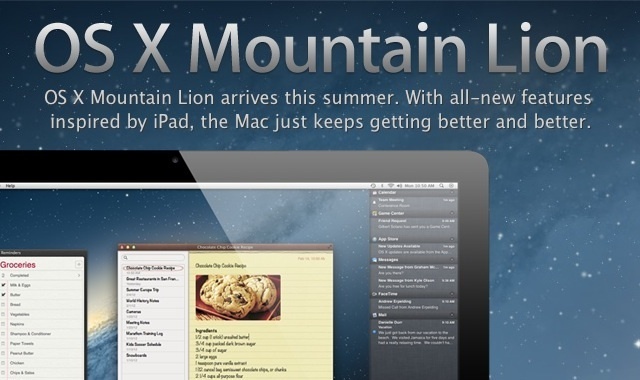 1) Login to the cloud - With Mountain Lion, you can use your Apple ID to login to your Mac. Upon logging in, iCloud synchronises all your emails, documents, photos and contacts. And just the same way that iCloud works today, any changes made on the Mac are instantly reflected across all your devices - iPhone, iPad and iPod touch. 2) Messages - Messages is iMessage for the Mac and the existing iChat rolled into one. You can add chat via your AIM/ Google Talk/ Yahoo! account or send unlimited message to iPhone, iPad and iPod touch users using iMessage - for free! It also features attachment support, delivery reports, read receipts etc. 3) Reminders - An all new Reminders app that syncs to your iPhone, iPad or iPod touch via iCloud. 4) Notes - A revamped Notes app that lets you add photos and other attachments to notes. The ability to pin notes to the Desktop is sure to come in handy. Notes is iCloud enabled as well. 5) Notification Center - Perhaps our favourite feature is an iOS style Notification Center. Mac OS X will be the first OS X release to have a built-in Notification Center that lets you stay on top of things. You can say goodbye to third-party solutions like Growl. 6) Share Sheets - Share Sheets are heavily inspired by the share button seen across the Web. A handy way of emailing links or posting videos to Youtube, we believe you will use this feature more often than you can probably think right now. 7) Twitter - Twitter integration is another feature that's straight from iOS. Operating System level support for Twitter accounts that lets you sign-in once and tweet from any application, will be very useful. Though Apple doesn't mention Address Book integration with Twitter yet, we expect it to show up eventually. (Editor's Note: After the huge outcry over iOS Address Book data sharing, we think Apple may have decided not to discuss the feature publically until it figures out how to handle it in OS X). 8) Game Center - iOS gamers would feel completely at home in the all new Game Center app for OS X - discover games, interact with friends, track scores etc. 9) Airplay - Airplay Mirroring is as easy as on iOS. With an Apple TV hooked up to a television set, Air Play lets you mirror your Mac on a HDTV or simply stream the movie playing on your Mac to the TV. 10) Gatekeeper - Gatekeeper is designed make your Mac more secure. It gives you the ability to run your Mac in 3 different modes. The first one lets you download and install any app you want, just like OS X Lion. The second lets you run apps from the Mac App Store and apps with a Developer ID. The third mode restricts your Mac to only apps from the Mac App Store. While power users and developers will want to stick to the first mode, your Grandma would love the safety of having only Apple tried & tested apps run on her Mac.